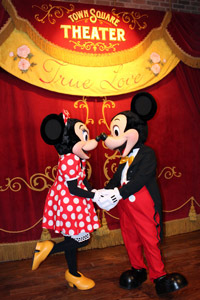 This week is True Love Week at Disney’s Magic Kingdom for Limited Time Magic (below, left). Princes joined their princesses in greeting guests, and it’s been extremely popular. 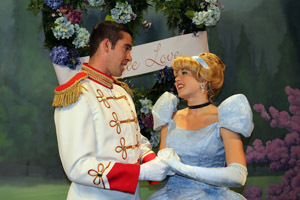 Cinderella poses with Prince Charming (below, right) in front of a True Love wreath. 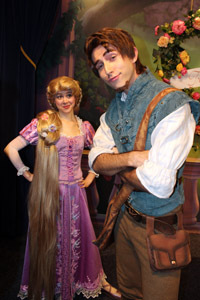 Guests always flock to see Flynn Rider with Rapunzel when he’s out (below, left), the line was as long as 90 minutes for the Town Square princess lineup – and the next day it was 120 minutes! We were happy to get to see Flynn again, he remembered us from his last official day – we have a YouTube video of that emotional goodbye. 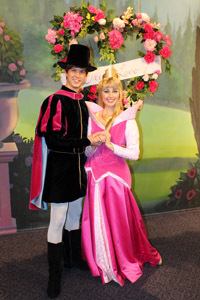 Prince Phillip (below, right) poses with Princess Aurora, we have rarely ever seen him out. 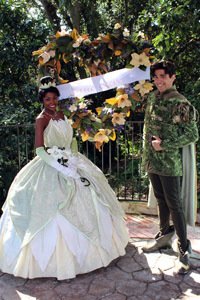 Minnie lifts her leg while kissing Mickey in Town Square Theater (below, left) and Princess Tiana poses with Prince Naveen in front of a True Love wreath (below, right). Prince Naveen told us how “three red-haired boys” made off with the beignets, referring to Brave! 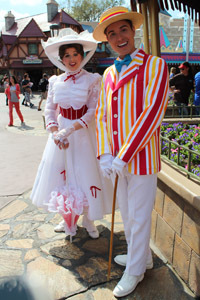 Bert and Mary Poppins both greet guests in Disneyland, but this is a rarity to see him out and about (below, left). Jasmine and Aladdin pose for us in Adventureland (below, right). Most of the characters were not signing autographs, but autograph cards were being handed out. Colorful flowers were handing in the hub (below, left), and the Plaza Rose Garden roses were in full bloom (below, right). 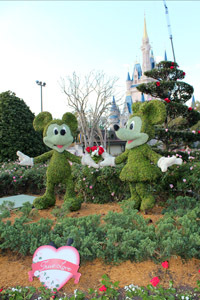 Mickey and Minnie hold flowers in their hands (below, left) at the entrance to the Rose Garden. 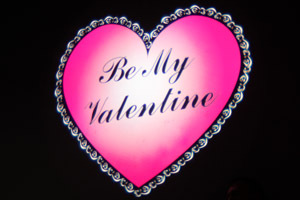 Inside the Town Square Theater, this “Be My Valentine” heart projection shines bright. There wasn’t any merchandise or special food items when we were there, the main draw was the princesses with their princes. Happy Valentine’s Day everyone! 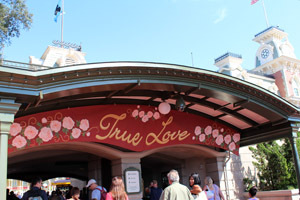 Video – Disney’s True Love Week – Limited Time Magic, Magic Kingdom, Flynn Rider & Rapunzel, Tiana & Naveen – True Love Week started at the Magic Kingdom in Walt Disney World, and includes meet & greets with princesses and their princes! Flynn Rider and Rapunzel, Princess Tiana and Prince Naveen, Cinderella and Prince Charming, Jasmine and Aladdin, Bert and Mary Poppins, Princess Aurora and Prince Philip, and Mickey & Minnie are all included in the video! For many more great photos, please check out MouseSteps latest update HERE! Seasons Greetings from Jeff Lange! 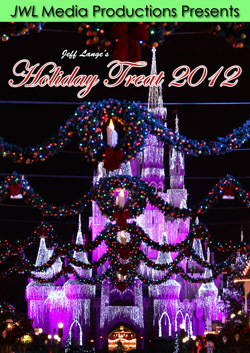 Celebrate the holidays with this new DVD featuring the 2012 Mickey’s Very Merry Christmas Party at Walt Disney World. 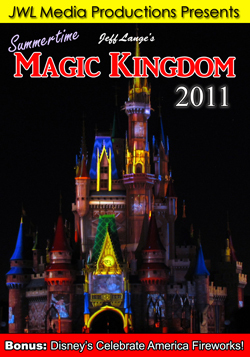 Features yearly favorites such as: “Cinderella’s Holiday Wish (Castle Lighting)“, “Mickey’s Once Upon A Christmastime Parade“, The Magic, All-New Celebrate The Magic! 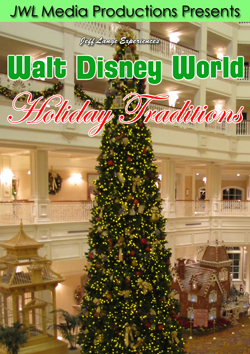 (Holiday Segment), “Holiday Wishes Fireworks – Celebrate the Spirit of the Season“, “Celebrate the Season Show“, Very Merry Party Scenes, and much more! Available Now – The Splendor of the Holidays at the Walt Disney World Resorts! Jeff Lange brings you this latest DVD in a series that features one-of-a-kind Disney experiences: Walt Disney World Holiday Traditions. Experience the splendor of the holiday season at the following Walt Disney World resorts: Disney’s Animal Kingdom Lodge Kidani Village, Disney’s Animal Kingdom Lodge Jambo House, Disney’s Coronado Springs Resort, Disney’s Beach Club Resort, Disney’s Yacht Club Resort, Disney’s Boardwalk Resort, Disney’s Grand Floridian Resort, Fort Wilderness Resort & Campground, Disney’s Wilderness Lodge, Disney’s Polynesian Resort, Disney’s Contemporary Resort, Bonus: Walt Disney World Dolphin and Walt Disney World Swan. to purchase this item, please click HERE. 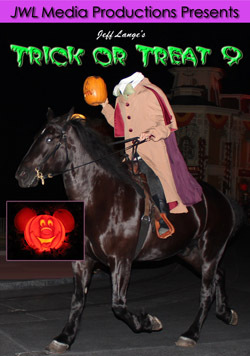 Jeff Lange presents this all-new DVD from the 2012 Mickey’s Not-So-Scary Halloween Party at Walt Disney World! 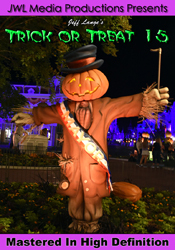 Featuring: Not So Scary Entrance Scenes, Trick-or-Treat Trails, The Headless Horseman, Mickey’s Boo-to-You Halloween Parade, Happy HalloWishes Fireworks, Villains Dance Mix and Mingle, Not So Scary Party Scenes, Haunted Mansion at Midnight and more! 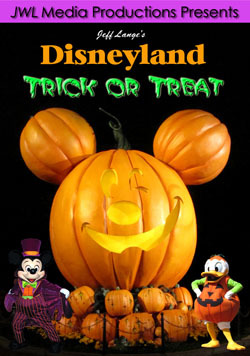 Jeff Lange presents this all-new DVD from the 2010 Mickey’s Halloween Party at Disneyland! Featuring: Spooky Halloween Party Scenes, Snow White’s Scary Adventures, Mickey’s Costume Party Cavalcade, Space Mountain: Ghost Galaxy, Halloween Screams – A Villainous Surprise in the Skies Fireworks, Haunted Mansion Holiday and more! Join Ron Schneider as he chronicles his journey from the early days of Disneyland to his years at EPCOT Center’s Journey Into Imagination – including a previously unreleased ride-through of the classic original attraction! The Ron Schneider Story (2012) – Ron shares in exciting detail the creative challenges he faced in bringing EPCOT Center’s only characters to vivid life. Anyone who’s a fan of Disney theme parks – or has ever held the dream of performing for an audience of millions – will enjoy these behind-the-scenes tales, told by a talented storyteller and theme park legend. 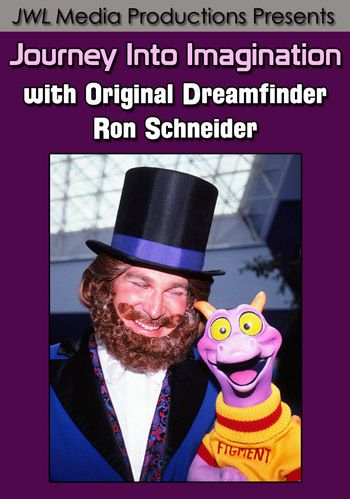 Journey Into Imagination with Commentary by Ron Schneider (1997) Ron offers up his thoughts and remembrances while you watch this never-before-seen footage from the original Journey Into Imagination! Journey Into Imagination (1997) Enjoy this previously unreleased 1997 ride-through of the classic Journey Into Imagination. This version features the exterior, queue and complete ride including all of your favorite original scenes with Dreamfinder and Figment! For more information or to purchase this item, please click HERE. 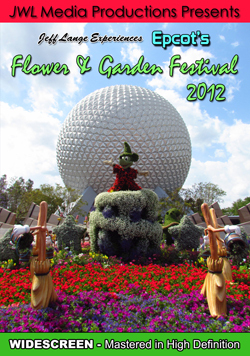 Celebrate spring at one of Disney’s most anticipated events of the year: The Epcot International Flower and Garden Festival 2012. Experience these unique panoramic displays throughout Epcot’s Future World and all around World Showcase! 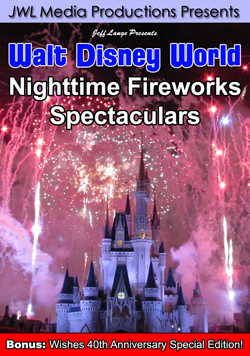 All New – The Very Best of Disney’s Nighttime Fireworks Spectaculars! Jeff Lange takes you to Walt Disney World to experience the very best of Disney’s Nighttime Fireworks Spectaculars! Featuring: Disney’s Celebrate America! A Fourth of July Concert in the Sky, Wishes: A Magical Gathering of Disney Dreams – 40th Anniversary Special Edition, IllumiNations: Reflections of Earth, Let There Be Peace on Earth Finale, Fantasy in the Sky New Years Eve Fireworks and BONUS: The Magic, The Memories, and You! (Romance Segment). Celebrate the summer of 2011 in style, as Jeff Lange brings you the newest offerings from Walt Disney World’s Magic Kingdom! Featuring the following 2011 summertime favorites: Entrance Scenes, Haunted Mansion Interactive Queue, Haunted Mansion Ride, Snow White’s Scary Adventures, Pirates of the Caribbean, The Magic, The Memories, and You! 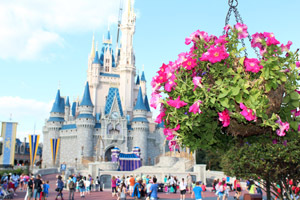 plusBONUS: Disney’s Celebrate America! A Fourth of July Concert in the Sky Fireworks Spectacular! Take a trip back in time to experience classic Walt Disney World “Frontierland” attractions. 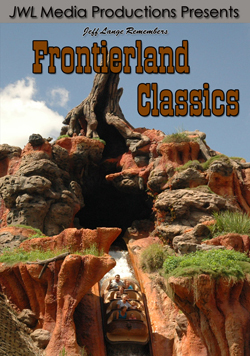 This fifth volume in the series features the following: Splash Mountain (1992), Frontierland Shootin’ Arcade (2006), Country Bear Jamboree (1992), Big Thunder Mountain Railroad (1997), Tom Sawyer Island (2006) and more! 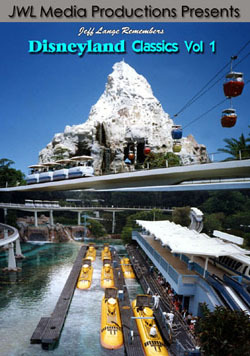 Take a trip back in time to experience classic Walt Disney World “Adventureland” attractions. 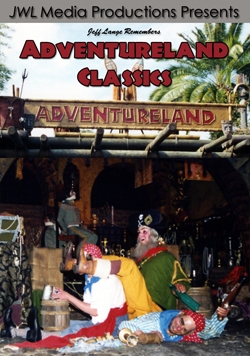 This fourth volume in the series features the following: Adventureland Tour (1992-1997), Jungle Cruise (1993), Enchanted Tiki Birds Tropical Serenade (1992), Pirates of the Caribbean (original version including Barker Bird 1992), Pirates of the Caribbean (1997) and more! 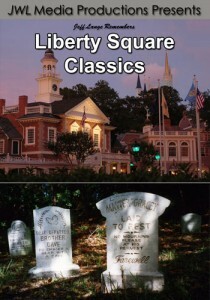 Take a trip back in time to experience classic Walt Disney World “Liberty Square” attractions. 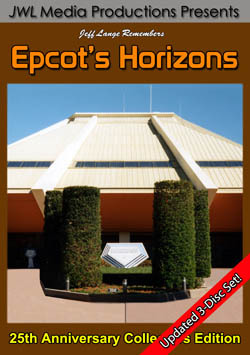 This third volume in the series features the following: The Hall of Presidents (Original Version – 1993), Mike Fink Keel Boats (opening day attraction – 1992), Haunted Mansion (original version – 1992), Haunted Mansion Bonus Ride (my final recording of the original version with some special surprises – 2006)! For fans of classic Epcot Center, I present my Epcot Center Historical Collection! 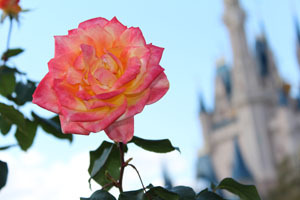 Jeff Lange turns back the clock to 1986, where you will experience Walt Disney World through the eyes of Disneyana documentarian Bob Welbaum. This incredible vintage footage includes select narration from Mr. Welbaum, who shot this video before recording was commonplace. 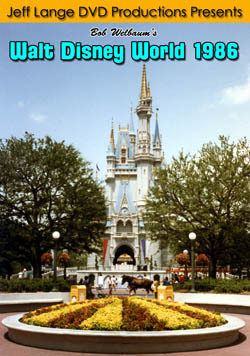 Walt Disney World 1986 contains clips from the following: Walt Disney World Resorts, Original Disney Shopping Village, Epcot Center, Discovery Island, Magic Kingdom, Seven Seas Lagoon and much more! or to purchase this item, please click HERE. Aladdin’s Royal Caravan (1993), Disneyland Railroad(1992) including the burning settlers cabin, Big Thunder Ranch and more, Beauty and the Beast Show (1993),Pinocchio’s Daring Journey (1993), Alice in Wonderland (1993) andFantasy in the Sky Fireworks (1993)! 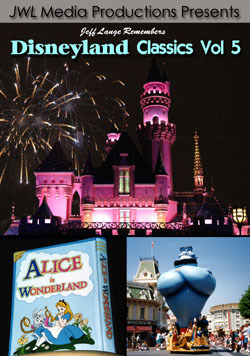 Also available: Jeff Lange Remembers: Disneyland Classics Volume 1 – 4. Click here to browse the JeffLangeDVD store. As always, if you want to request a future DVD idea, Photo Memory topic or comment on anything, just drop me a line at suggestions@JeffLangeDVD.com.